« Pup Star: World Tour – Entertaining, Witty, Sassy And Completely A Family Friday-Night Movie. An intimate portrait of an unlikely rock star: Justice Ruth Bader Ginsburg. With unprecedented access, the filmmakers explore how her early legal battles changed the world for women. KIDS FIRST! 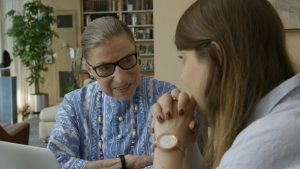 Film Critic Gerry O. comments, “This documentary, RBG, tells you about Ruth Bader Ginsburg, Associate Justice of the U.S. Supreme Court and not only inspires you, but motivates you to change the world just as she did.” Ranny L., KIDS FIRST! Juror adds, “She is an inspiration in so many ways. Shy and somewhat introverted, she never let that keep her from pursuing a career path that was unique for woman at the time.” See their full reviews below. In one of the most divided political times in the recent history, it is good to look back to the previous decades and see the changes and inspiration that occurred in America. 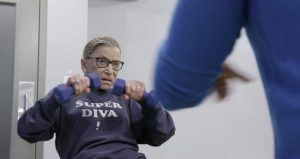 This documentary, RBG, tells you about Ruth Bader Ginsburg, Associate Justice of the U.S. Supreme Court and not only inspires you, but motivates you to change the world just as she did. At its core, this documentary will inspire people. It doesn’t hide th e many aspects of life’s challenges. Throughout Ruth’s life, there are moments of romance as well as drama. 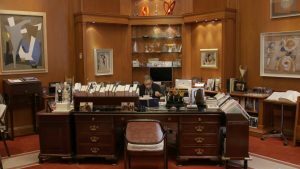 On the opposite side of the coin, there are many comedic moments, ranging from fun antidotes about Ruth’s workaholism to Saturday Night Live skits. Starting from her childhood to the present day, RGB reveals the essence of Ruth Bader Ginsburg. She is the female attorney who, not only fought for women’s rights in the United States, but also spent years on as a Supreme Court Justice fighting for women’s rights. This film truly gives real insight into the fight for women’s education, equal payment in the workplace and equal treatment in every situation. Despite gender discrimination (which still occurs w orldwide), few know the efforts women have gone through, in order to receive the same rights and treatment that men have. The film also shows many aspects of her personal family life as well as struggles she has survived, such as surviving cancer. One of my favorite parts of the film is when it shows how political differences don’t mean that two people cannot get along. Antonin Scalia, also a Supreme Court Justice, and Ruth were best friends for many years. Scalia was a staunch conservative and Ruth was always quite liberal. Often, in court, they differed in opinion. Yet, as the film shows, they were friends in real life, with no hard feelings despite their political differences. Their friendship delivers an important message for our nation today – that politics should not be something that breaks and blocks relationships. RBG doesn’t rely on a single narrator to explain the life of Justice Ginsburg, there are many people who talk about her. Throughout the documentary, the person we hear from the most is Justice Ginsburg herself telling her stories. 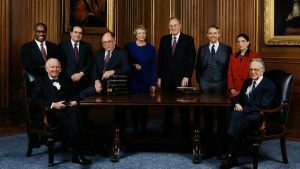 Skilled research and editing incorporate real-life speeches at the Supreme Court, as well as many hearings when Ruth was a lawyer. This gives a unique realistic feel to the film. Instead of being lectured about the subject, you feel as if you are part of her story. This also has its downsides. The documentary flows chronologically, but it also focuses on many aspects of Ruth’s life. In some ways, the film deals with so much information that it can become overwhelming. While Ruth’s story is something we all should hear, it is complex with many mature details and important subjects. I recommend this film for ages 13 to 18 as well as adults. It truly is a film that teenagers should see, as it demonstrates how anyone is capable of change. I give the film 4.5 out of 5 stars. Justice Ginsburg proudly speaks about bein g born and bred in Brooklyn. In the 70s she co-founded the Women’s Rights Project at the ACLU. We listen to Gloria Steinem and Nina Totenberg reveal tales of her past that make you realize how pivotal her involvement in the women’s movement was. 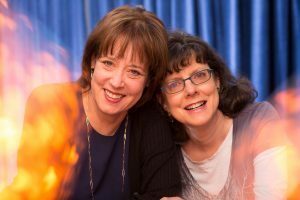 Filmmakers Julie Cohen and Betsy West dig into the substance of this woman with a judicious zeal usually reserved for our deceased heroes. 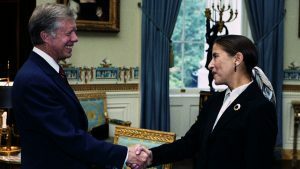 As a staunch feminist, her nomination to the Supreme Court could have been way-laid had not President Clinton been wowed by her in the first 15 minutes of her interview with him. Then, he knew that he had to put her on the Court. The love story between Ruth and Martin Ginsburg is nothing less than awe-inspiring. I love how she tells about her undergraduate years at Cornell where there was a four to one ratio of boys to girls. “Every mother wanted to send their daughter there because, if you couldn’t find a husband there, you were hopeless.” She reveals that during her freshman year, she never dated the same boy twice. That is, until she met Marty, who was the first guy that recognized she had a brain. When President Carter brought her to the federal bench, Marty gave up his success career as a tax attorney in New York to move to DC to support her. 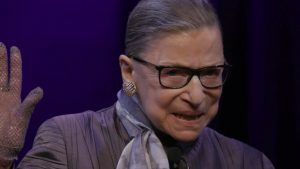 He recognized Ruth for the super star that she is and later, when she was nominated to the Supreme Court, rallied on her behalf with endless enthusiasm. Also noted is that he was the cook in the family. Her children tell how they had to keep her out of the kitchen. 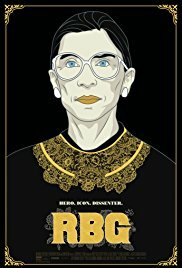 One thing I really like about this film is that it focuses on Justice Ginsburg’s life long fight against gender discrimination. She experienced it first hand as a fresh law school graduate that could not get a job in any law office in New York City because “they didn’t hire women.” She has never given up the fight, and there have been many – for women in the military who were discriminated against f or pay and benefits, for widowed men who couldn’t get survivor benefits. She chose her plaintiffs carefully, picking a male to show that gender discrimination worked against both men and women. Although this film may lack verve in terms of groundbreaking filmmaking, it is stunning beautiful in telling the story of a contemporary hero. 84-year-old Justice Ginsburg is an icon of our times. A woman who has weathered extremely difficult conditions and sits on the highest court in the country as someone dedicated to equality – for women, for people of different races and cultures – for all of us. She is a modern heroine and, as shy and quiet as she is – carries a big stick! I have been touting this film to all the young women and men in my universe and sending them to it. Most walk away stunned. My 20-year-old friends never even knew who she was before going to see the film. Many weep as they watch it. Now, that’s something. That’s important. If this film manages to get one young person’s attention and give them the courage to stand up for what they believe, then Directors Julie Cohen, Betsy West have something to be outrageously proud of. I believe they have. This entry was posted on Friday, May 11th, 2018 at 2:37 pm and is filed under Feature Film Reviews. You can follow any responses to this entry through the RSS 2.0 feed. Both comments and pings are currently closed.